Bessy Bell and its lower neighbour, Mary Gray, are named after the heroines of a Scottish ballad. This begins Bessie Bell and Mary Gray, they were twa bonny lasses. The obvious Scots origin of the name did not deter Samuel Lewis from making an extravagant connection between Bessy Bell and the pagan deity Baal in his Topographical Dicitionary of Ireland (1843): “On the summit of Bessy Bell, or ‘Boase-Baal’, on which in pagan times sacrifice is supposed to have been offered to Baal or Bel, is a large and curious cairn.” Sliabh Troim is the original Irish name. Also recorded as Sliab Toad [LGÉ]. 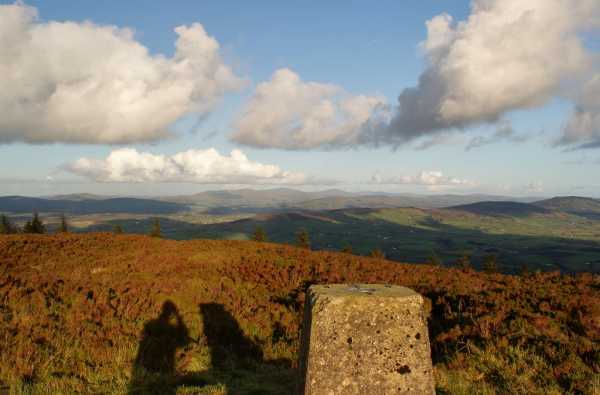 Bessy Bell is the 843rd highest place in Ireland. 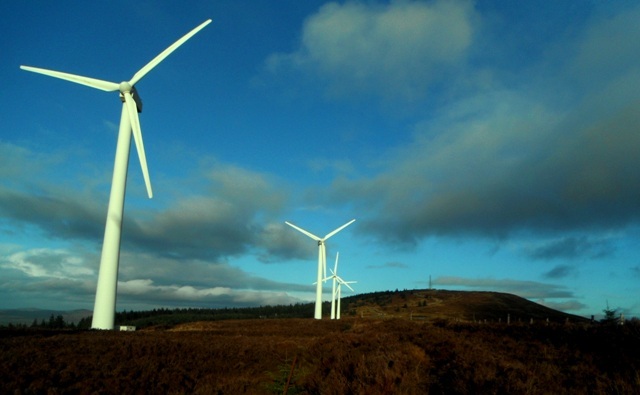 This is a hill I'd been wanting to climb for a while, for despite its relatively low height, it and the wind farm on its lower slopes are very prominent from nearby summits owing to its relatively detached position at the western end of the Sperrins. The Ulster Way conveniently passes over the summit (not sure it always did though - the route was altered and relaunched about a year ago). 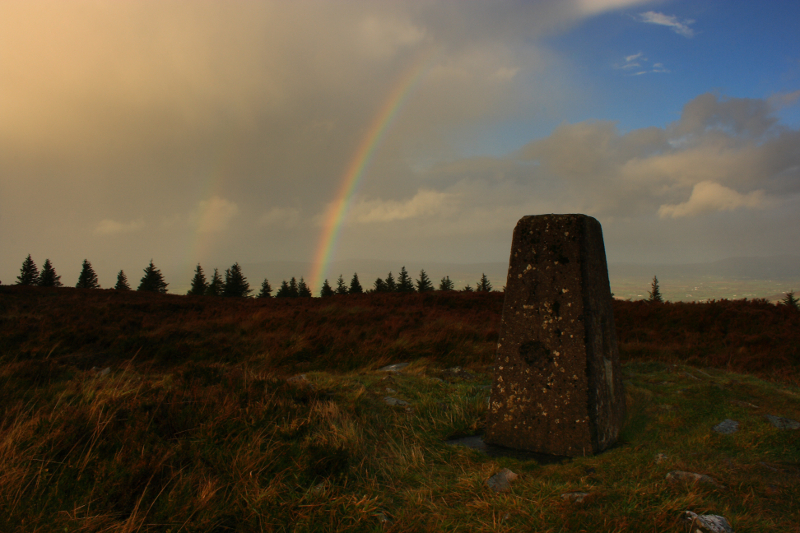 I climbed Bessy earlier this week when driving between Omagh and Strabane. About 5 miles past Omagh I took the turn-off for Mountjoy on the left, just after a garage. A couple of miles past the village you'll see an Ulster Way sign, joining from a minor road on the right. The UW then takes the next left turn at 411821 B and I followed this uphill. This is a very steep, narrow road and luckily I didn't meet anyone else on the way up or down. The road soon levels out with an abandoned, two storey farmhouse on the left. I parked next to this and made the rest of the journey on foot. While OSNI map 12 suggests the road continues on from here it really becomes a grassy, hedged-in track. I followed the UW uphill and in a zigzag, over several stiles (some weren't necessary as the gates were open - one I was able to lift off the ground! ), passing close to another seemingly abandoned farmhouse to the right. At times you'd be on a track and others passing through fields with grazing sheep and cows, with the turbines close by overhead. Sometimes the signage wasn't obvious which caused a bit of head scratching and a couple of wrong turns. Eventually a sign points off the track onto the open hillside and I began my ascent. Frustratingly I didn't see another sign on the ascent but luckily ended up right at a stile crossing a fence near the summit. The terrain was typical Sperrins: grassy, heathery, reedy in parts and luckily not too wet at the time. The trig is just a short distance from the fence with some masts beyond. I could see the wind farm access track that mcna and pquinn572 must've taken coming up the other side of the hill. The view of the rolling Tyrone countryside N and E was impressive. 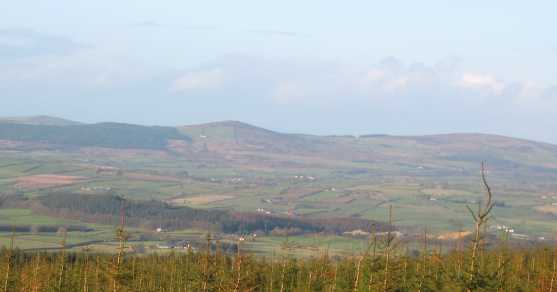 I could see Mullaghcarn, the higher Sperrins beyond and Owenreagh E of Strabane with its own wind farm. I could also make out Omagh and Strabane. The Bluestacks were visible but NW was hazy so I couldn't make out Muckish, Errigal etc. Return was by the same way, though this time I noticed an UW sign pointing downhill along the fence and I followed this until a sign pointed right again. There were dire predictions of hurricane force winds on the forecasts, but it looked like we would miss the worst of it, so I decided to walk the nearby Bessy Bell. Besides, I had a new pair of cheap, waterproof over-trousers, and thought today would be a good test. I parked at Point C on the Cashty Road and set off up the gravel track to the summit in bright, warm sunshine. On the way up I experienced all four seasons, By the time I reached the top, heavy rain was driving sideways in extremely strong winds. Using the tripod was impossible, and it was nearly impossible to even stand still for hand held photos. Views were obscured by low cloud and heavy rain, but it was easy to see they would be worth the climb on a good day. I'll just have to return for better shots. 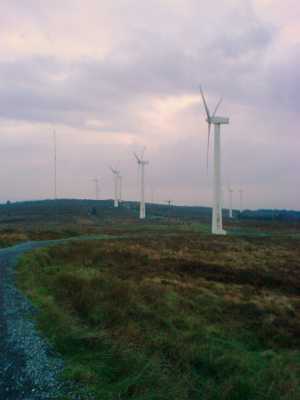 There are plenty of access points on Bessy Bell which is criss-crossed with tracks to serve forestry and wind farms. Started at the track at 369816 C where there is loads of parking space. Several signs warned of the danger of 'shooting in progress' but all was quiet at this stage! Follow the track northwards for around 5 minutes where it joins the uphill escalator straight to the summit. Already from here could see the communications mast at the summit and wind turbines turning lazily amongst the trees. The track uphill is as straight as a die, with lifeless deciduous on one side and green pine on the other and a tumbling stream. 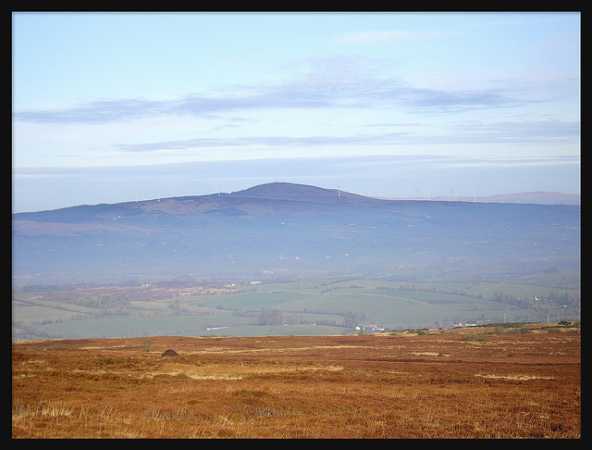 Views are wide to the SW to the Bluestacks and as height is gained the high Derryveaghs come into sight. As the track enters an area of clearfell views open further to the N with the Urris Hills, Raghtin More and Slieve Snaght visible. The deep call of ravens echoed through the trees. Coming out of the forest the wind turbines were fully visible. Two scramblers were making use of the tracks and a volley of shots came up from below - I kept looking back expected to see fireworks such was the noise (and it was the 4th of November!). Ravens were soaring on the breeze around the summit and the communications mast was soon reached. The trig pillar is a short distance away. Views are extensive to the E to Mullaghcarn and up along the hills either side of the Glenelly valley, to the SW Cuilcaigh and the Sligo Hills and pretty much all the high hills from S to N Donegal - pretty damn good!